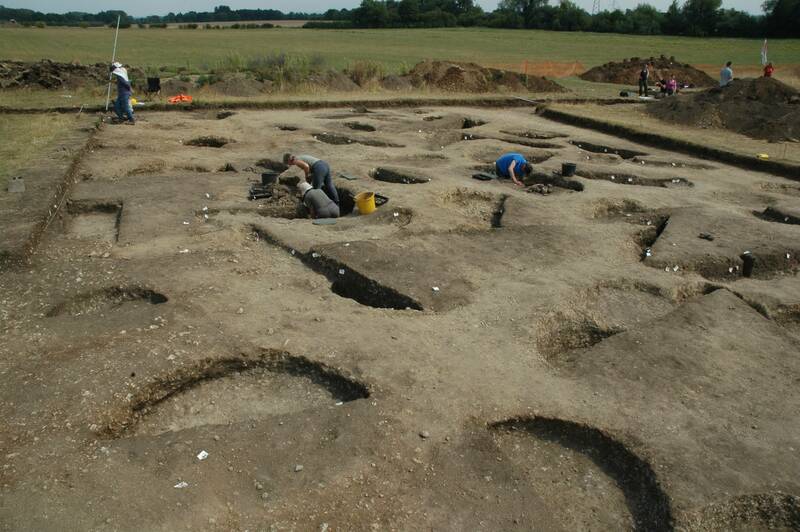 For 11 years from 2001, undergraduates and Continuing Education students from Oxford University and members of the local community took part in excavations at Trendles Field and the former Noah’s Ark Inn, Marcham, under the directorship of Professors Gary Lock and Chris Gosden. The site is of national importance, with a Roman temple, amphitheatre and large public buildings, and has a wealth of well-preserved archaeology. The annual excavations always attracted considerable local interest, not least from the landowners, the Cumber family. Although taking place at one of the busiest times in the farming calendar, they took an active interest in the excavations, lent support where needed, and found time to make regular visits to the site. In the article below Will Cumber discusses the history of the excavations and some of the current interpretations of the function of the site. The existence of a Romano-British temple in the garden of the former Noah’s Ark pub was confirmed by the original excavation by Bradford and Goodchild in 1937-38. However, the rest of what has turned out to be a substantial complex of associated buildings from the same era, coupled with a possible amphitheatre, was not discovered until 1982. Oxford University subsequently excavated the site, working for four weeks each summer, between 2001 and 2011. “The Big Round Thing” – An Arena or an Amphitheatre? Work continued in 2006 and 2007 on the drainage system within the arena, and on what turned out to be a probable main entrance on the western side and also on the bank around the outside. At the western edge, as hoped, there was an obvious step let into the wall, and a graded gravel pathway led down into the arena. Traces of a graveled pathway also led away in the direction of the temple, and there were foundation remains of a couple of small structures – immediately nicknamed ‘The Ticket Office”. Excavation both through and outside the bank revealed that the bank was probably not particularly high; it was likely that it was formed simply from material dug out from the arena, placed directly into the pre-exiting soil surface. There were further depositions, both of small finds and bronze and bone objects, but also the skeleton of a cow – “Daisy” – probably a fully-grown animal but rather small by today’s standards. Its mature bodyweight might have been about 300kg compared to at least 500kg today. Work in the arena was brought to a halt on 19 July 2007 when over four inches of rain fell, resulting in it being completely flooded, a situation which persisted through 2008, with work only starting again in 2009 when the natural water table had finally fallen. It looks as though whatever activities went on in the arena ceased toward the end of the fourth century, after which the arena appears to have become a dump, as further investigation of the fill revealed large quantities of broken pottery mixed with stone. This tends to confirm the site went out of use when the Roman Empire became Christianised. This has continued to fascinate and surprise throughout the whole of the period of the dig. Initially it was assumed that it would terminate somewhere just outside the bank of the arena, however successive trenches down the field revealed that in fact it runs for approximately 250 metres and ends 50 metres from the southern edge of the field. Throughout its entire length it is of the same sturdy construction; the side walls are built of well-coursed stone, capped with massive slabs of limestone, many too heavy for one person to lift. It is completely filled with silt sometimes in defined layers, but analysis of the silt through sieving and flotation has revealed little debris of human origin. It is unclear for how long the drain would have worked effectively as in several places the capstones have cracked and fallen in, also it is likely that a certain amount of silt would have washed in through the un-mortared walls. At its end here is possible evidence for later exploration; the last few capstones appear to have been piled back on top of each other perhaps in an effort to find out why it was not working. There is a very nice juxtaposition in that a modern tile drain, laid by White Horse Contractors in 1970, neatly cuts through the Romano-British drain just a few metres from its end. With no sign of anything which might have enabled the water level within the arena to have been controlled, it remains unclear whether the drain simply stopped the arena from filling with water, or, given the earlier theory of a sacred pool, whether it was to regulate the water level. In either case it seems a monumental piece of work, considering that an open ditch would have served the same purpose once the arena bank had been negotiated, and would have been infinitely easier and quicker to both construct and maintain. One possible explanation is that for “religious reasons” it was appropriate to take the water away unseen. Around the end of the drain much must have been a very boggy area at the time, there is an immense deposition of pottery fragments and bone; this has been taken off layer by layer, revealing cobbled pathways and even a possible wall foundation. 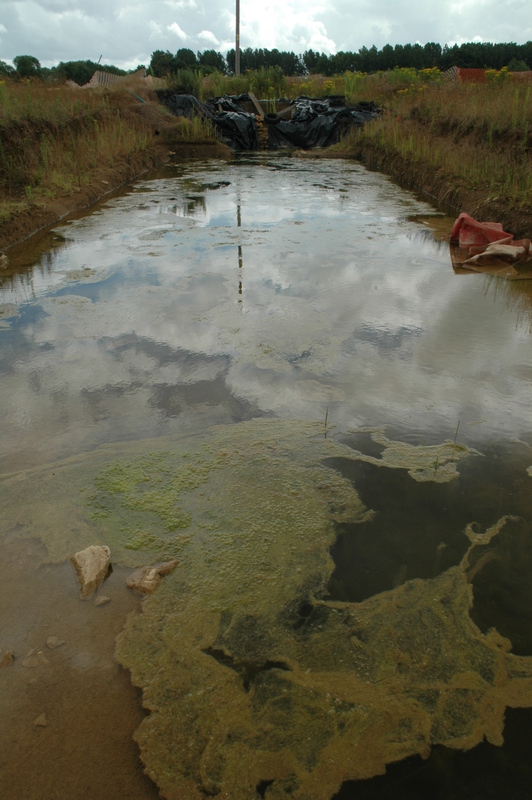 Whether the area was just being used as a dump, or whether – yet again – there was an important significance to the deposition, remains to be determined. This is one area where limited work may continue in future years. In 2007 a pair of large pits, which had showed up on the original geophysics, were uncovered, but the trench also revealed one wall of a stone structure on the western side. 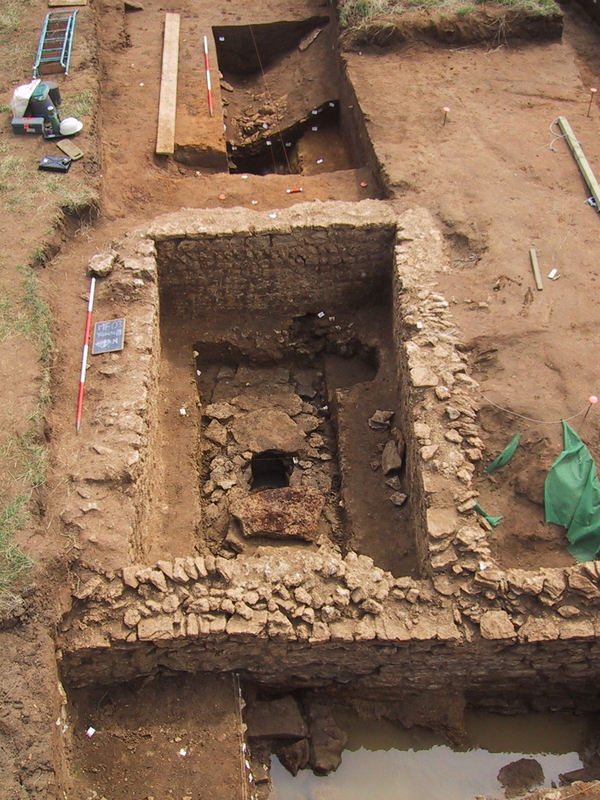 An extension to the original trench revealed an interesting example of the continuing occupation and activity at the site. The two large pits were from the Iron Age, but at the top the fill was from the Romano-British period. Positioned in between, apparently respecting their position, was a building four metres square, with a large pit within it. This pit, of unknown original date, had been carefully filled with stone but leaving a cylindrical shaft within it. This contained hundreds of coins, presumably deposited as votive offerings. This building is also linked to the temple enclosure or temenos in that it is exactly in line with the entrance to the temenos and also, as 65 metres, (or 44 Roman passus) exactly the same distance from the temenos entrance as the temenos entrance is from the temple itself. A few metres west of this possible shrine, in another pit, was a crouched burial of a young adult from the Iron Age; such burials are relatively unusual, and it is possible this was a human sacrifice. In 2008 English Heritage gave permission for parts of the Scheduled Ancient Monument Area behind the former Noah’s Ark pub to be opened, both to look at some of the ditches and pits which showed on geophysics and as crop marks, but also to reopen the temple site itself. The reason for this latter permit was to confirm the ground plan and a probable date for its construction; Bradford and Goodchild in 1939 had suggested a date in the late 1st century, while Denis Harding in 1964 had put a much later date on its building. 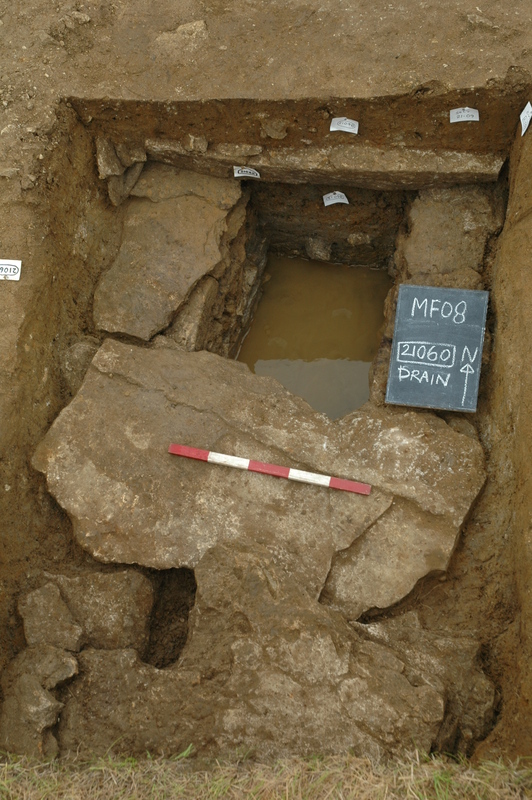 It was possible to see both sets of excavation trenches, as well as one dating from 1987 when the accommodation block at the Noah’s Ark Inn was built. An unexplained dump of tile on the north east side of the temple had two different types of tile, one dating from the early second century, the other from the third, suggesting a rebuild of the temple at some point, and also explaining the different construction dates by previous excavators. Externally there were substantial amounts of remnants of painted plaster, suggesting that it was the outside of the building that was so decorated. The ditches and pits to the south proved both many and complex, cutting into and through each other so that a chronological sequence could be determined, but without a clear understanding of their purpose. Pottery finds suggest activity from the middle Iron Age (c. 500 BC) right through to the Romano-British period. The southern wall of the temenos was visible overlying some of these features with limited evidence that the foundations had been strengthened where the wall passed over previously dug features. It is possible that there was a southern entrance to the temenos. There was no indication that the temenos, or at least its wall, continued to the west of the temple itself, where the ground slopes away quite sharply towards the River Ock. The original geophysics had showed a heavy concentration of presumed Iron Age features to the southeast of the Romano-British area, and a trench was opened over some of these in 2008. However the main excavations here took place in 2010 and 2011. It had been expected that there would be evidence of Iron Age domestic occupation, but three extensive trenches revealed no evidence or any buildings such as roundhouses. Instead, in the most southerly trench a number of substantial ditches some perfectly circular and measuring approximately 25 metres in diameter, and a very large concentration of pits were revealed. The ditches were inevitably filled with Iron Age debris, all either pottery fragments or bone. The bone finds proved to be almost entirely of jawbones from a wide variety of species – cow, horse, sheep and dog were all confirmed. This leads to speculation as to where the rest of the animals were disposed of. Further up the slope, where the Corallian limestone is much closer to the modern soil surface an intense concentration of individual and inter-cutting pits was exposed. Sadly, many of these have been truncated by natural down-slope erosion and agricultural activity, but at least six contained burials, either as complete skeletons or the partial remains. 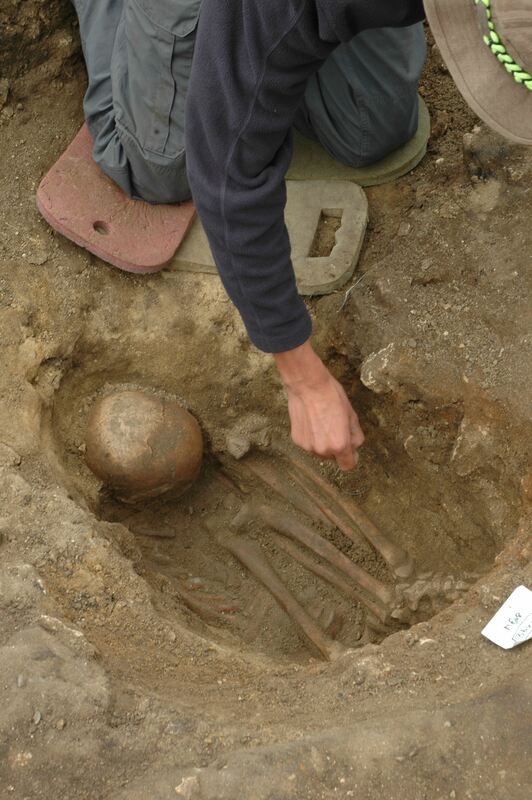 In every case the burials appear to be of children or young adults; five had been very carefully positioned within the pits, the latter just containing the usual pottery and bone fragments. At least one Roman coin was found in the top fill on one pit, indicating once again that the site was continually used throughout the period, and that earlier features would still have been evident in the post-occupation times. A trench started in 2006 just to look at the drain and the underlying geology revealed by chance another pit feature. Initial excavation produced a fine complete pot, but as the excavation reached deeper levels it was found that the pit was waterlogged. This was exciting as continuous waterlogging is the only way in which organic material can be preserved over such a timescale, and below the pot was a well-preserved leather shoe, of a slip-on type. This was taken away, still immersed in water, for preservation. The technique involves very gradual drying, by freezing, and replacing the water with a polymer type material which then maintains the structure of the object. It is unclear whether these articles were deliberately deposited, but the pot had a small hole in it, and this is typical of ritual deposition rather than rubbish disposal. No further work was undertaken here until 2010 due to a shortage of labour, but over the last two season the father and son team of Roger and Richard Coe have completed the excavation of this pit or possible well. There have ben further extremely exciting organic finds, now preserved, of a woven basket, containing leaves and other organic debris, and part of a wooden writing tablet; although the wax has long since vanished it may be possible using high resolution photographs and oblique light sources to determine if any remains of writing can be made out. A cobbled surface surrounded the well, possibly pre-dating it as the well may have been cut through it. Also revealed nearby was the trace of a small wall foundation, probably too narrow to be from the building, but possibly a boundary wall of some sort. Suitable articles, including a pair of boots and a rucksack, have been re-deposited in the well before backfilling to replace what has been taken out. It was perhaps symbolic that the 24-year-old Mazda pickup, which had provided off-road services for many years, expired permanently on the penultimate day; the clutch had been slipping for two years but it was the fuel pump which delivered the coup de grace. So, what have eleven seasons of digging at Trendles Field revealed? My own favourite question guaranteed to annoy a professional archaeologists, “But what does it all mean?” has – in part- been answered. Continuing activity on the site throughout the Iron Age and Romano-British period, covering at least 1000 years in total, has been largely confirmed. Also confirmed is that the whole area was used for religious purposes. Remote religious sites, especially close to sources of standing or running water, are not unusual in this period. What is perhaps surprising is the scale of this site, and the number and complexity of both pits and ditches, as well as later stone buildings and structures. The scale of the area also indicates that it could accommodate a large number of visitors. Questions which still remain unanswered however include the origins of people visiting the site and the distance they travelled; there is still no evidence for domestic occupation at the site although geophysics over a wide surrounding area show a great deal of activity wherever one looks. Finally, the exact function of the amphitheatre remains conjecture; it is still unique, at least in Britain, in its connection with the temple. The virtual lack of finds within it, compared to the enormous number of articles deposited around it, remains a conundrum. In the early years of the dig Professor Sheppard Frere opined “they’ll never understand it until they dig it out entirely”. Unfortunately, neither time, funds, nor people numbers have made this possible. Perhaps in the distant future it will be revisited by fresh eyes that will find a conclusive explanation for it. The end of the final season was marked by a party and barbecue on the site. Music was played, a roast pig was eaten, libations were consumed, and ritual deposits made, perhaps mirroring past activities of a similar nature.